The spinal column consists of 24 separate “free” vertebrae (neck, thoracic and lumbar spine) and the sacrum and coccyx. The facet or zygapophyseal joints link the separate vertebrae at the back, one on each side of the spinous process. Degenerative and/or inflammatory processes in these joints can result in pain that may be restricted to the joint structures, but may also spread to the neighboring nerve branches and extend as far as the back and thigh. MultiZYTE® is an instrument set for endoscopic minimally-invasive pain treatment of the facet and sacroiliac joints. The Set is used within the MultiZYTE® Facet and MultiZYTE® Sacroiliac methods. The nerve fibers causing pain are identified and selectively treated. The tissue is spared, and muscles and ligaments are prevented from damage. At the same time, surrounding tissue, muscles and ligaments are protected from damage thanks to the endoscopic procedure. This means that the stability of the spine is maintained. After gentle, minimally-invasive access, the treatment with MultiZYTE®Facet involves the removal of hypertrophic and infl amed tissue, opening of the joint capsule, irrigation as well as vaporization of the joint, and the RF ablation of pain-conducting nerves of the medial branch of dorsal ramus. 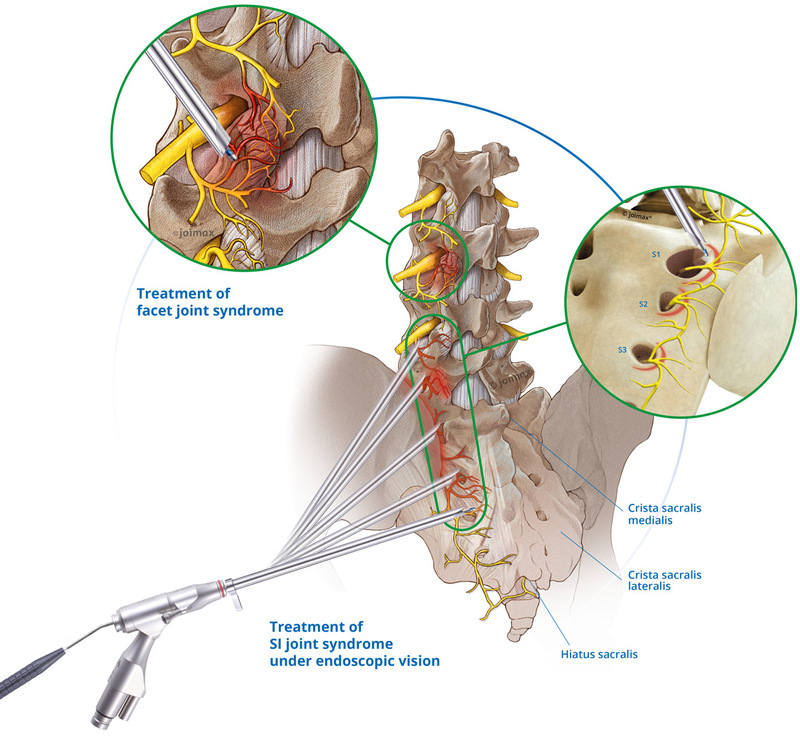 The MultiZYTE® animation shows the endoscopic facet joint treatment. 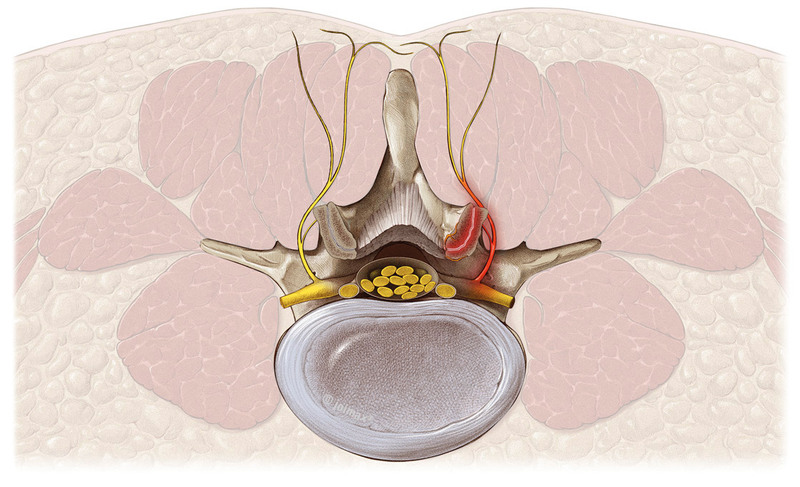 The pain treatment of the SIJ Syndrome using MultiZYTE®Sacroiliac follows the same basic principle as described for the facet joint treatment. Under endoscopic vision, tissue is removed, the joint capsule is opened bymeans of partial removal of the joint capsule, rinsed and vaporized. The RF ablation at pain-conducting nerves emerging from the sacral foramen and proceeding into lateral direction is performed from 12 o’clock to 6 o’clock at the lateral edge of the foramen. MultiZYTE® is an instrument set for endoscopic minimally invasive treatment of the facet joint. The nerve fibers causing pain are identified and selectively treated. The tissue is spared thanks to the endoscopic procedure, and muscles and ligaments are prevented from damage. This means that the stability of the spine is maintained. Depending on the indication, also the joint capsule can be treated during the same procedure. The joint is punctured, infiltrated or tissue removed by means of various instruments (forceps, shaver blades, RF probes).